Current Transformers are divided into 2 categories:- High Frequency Current Sense Transformers and Line Frequency Current Transformers. The High Frequency Current Sense Transformers are used in switching mode power supplies (SMPS) application, usually to detect and measure the current for the feedback control circuitry. These Current Transformers are designed using manganese zinc ferrite cores and the frequency of operation is 20Khz up to 1000 Khz. 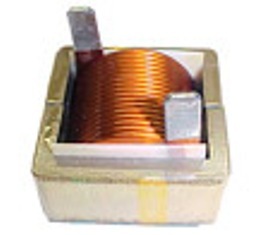 The Line Frequency Current Transformers are mainly used in precision instrumentation and amperes measuring devices for the 15 Hz to 200 Hz range. These Current Transformers are designed using tape wound cores due to the lower frequency of operation. The tape core materials used for these current transformers are various iron and nickel alloys, permalloy,amorphous, nanocrystalline, etc. Current Transformers are therefore used to measure current for power management and controls, applications in safety protection and in current limiting. Current Transformer uses a single turn primary. The primary winding is not built into the transformer itself. It has an opening or hole for the primary wire to go through. The number of secondary turns determines the current ratio. The 72-000, 72-100, 72-200, 72-300, 72-400 and 72-500 series current sense transformer are mainly used in 20 Khz and above in a switch mode power supply. The secondary inductance shown in our specification data is measured at the given voltage level ( the test voltage freq. is set at 15.75 Khz) shown at the right of the inductance value. The terminating resistor is also called the "burden resistor", and it is the resistor across the secondary terminals. The voltage across the terminating resistor is equal to Terminating Resistor divided by Number of secondary turns. This is the voltage that is being measured by the engineer for current monitoring purposes. The primary Unipolar rating refers to single ended wave forms ( swing from zero to positive) such as in forward topology, etc. Primary bipolar primary waveform refers to double ended topology ( swing from positive to negative). These ratings are in Amperes-microseconds, and it is the maximum at which the transformer core will not saturate. Amp-microsec is the current flowing through the primary multiply by the ON time. The peak primary current these transformer can handle is up to 35 Amps.